Based on the popular modular EOD Pouch, this miniature version is more compact but no less useful. 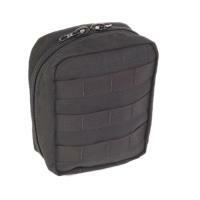 Made from ultra-durable ballistic nylon, it attaches to popular mounting systems with a set of included HSG Clips. Inside the bag there are six individual pockets for easy organization, making it an ideal admin pouch or trauma kit carrying solution. The clam-shell zipper opens up the entire front for convenient access to every compartment at once. Once zipped up, though, it effectively protects the contents from environmental damage. Like other High Speed Gear products, the Mini EOD is covered by a lifetime warranty.